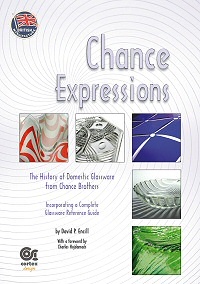 A study of all the domestic glassware produced by Chance Brothers from 1929–1981, and incorporating a collectors' guide. From a collectors point of view there is very little to help with the identification, dating, valuation and relative rarity of domestic glassware produced by Chance Brothers. There are also many misleading comments and statements that simpy propogate rumours and incorrect identification for some of the patterns – all these	are addressed in Chance Expressions. Now available as a 2nd edition with many updates and a few new photographs.